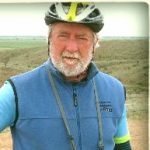 The ride starts in Canberra and finishes in Moruya, distance 172 kms of which about 90kms is good gravel road with numerous hills, MTB’s preferred but touring bikes would comfortably manage subject to good weather conditions. The route from Canberra takes in the old mining towns of Captains Flat, Majors Creek, Araluen and finishing up at Moruya, if utilizing public transport from Sydney 5 days would be required to complete the trip. Several friendly Greyhound buses leave daily for Canberra, only one Priors Bus leaves Moruya for Parramatta we hooked up with the train at Bombaderry for the ride into Sydney. No problem in Canberra and Moruya bookings required at Captains flat and Araluen. Camping available. This is a must do trip taking the early bus to Canberra allows time to ride and visit the sites in Canberra and to catch up with Libby on the steps of Parliment, the scenery from start to finish is superb from rolling hills to scenic valleys. Winding narrow country roads steep declines, the highlight was the 6km descent (700m) into the Araluen Valley and the ride along the Araluen Creek/Deua River valley into Moruya. The locals were very friendly, we we met a decendant of the Clarke Bros(a notourius band of bushrangers roaming the countryside in the 1850’s) Noel had a good tale to tell sitting on the verandah of the Majors Creek Hotel: When we had trouble with accommodation in Araluen the local plumber helped out with individual rooms in his house and at a good rate! The bus ride back to Bombaderry and the train trip to Sydney is also not to be missed. Glad you had a good trip- still a bit of water around by the look. Will add to the must do list.